In the game, you run a city by constructing houses, stores, and transport stations. People buy the stuff from the stores and you earn money. You need houses to let the people live in the city and transport for supplying the goods from store to apartments. So the basic game cycle is -> House -> more people -> buy stuff -> stores -> transport -> supply goods. If you don’t have enough house, you will not be able to invite more people to the city. Without growing the population, you can’t progress. So all the players need to build houses for city growth. The next thing is the store where the citizens visit and shop for items. If you have fewer stores, but more citizens, then you will not be able to get the most out of that population strength. So it’s necessary to keep the balance. Also, the more you have the population, the more cars you will need for transportation. How many houses, stores, and cars that you can build in the city? It depends on the city. You start from the Newton city and progress to the next cities once you reach a certain city value. Tap the (?) button above the search button(Research) at the bottom left side of the screen. Here you can check the maximum number of houses, cars, stores that you can build in the current city. These numbers increase in high-rank cities. You will see a warning sign(!) over the buildings or cars if you need more. 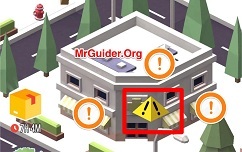 To purchase more buildings(house, stores) or cars, tap the shop icon/(i)/avatar (use the finger to explore the game screen). Tap it and you will get the buy option. There are two types of researches in Idle Island – City Builder game; common researches and epic researches. You can unlock/upgrade the common researches by spending the Idle money. If you want to know the details of research buff, tap the (?) next to it and it will tell you the buff details. On the other hand, you often get the Epic researches from the parcels. 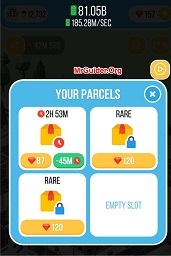 Parcels Guide – How to get? From the parcels, you can obtain the epic researches, powerful boosters, and many more items. To get these parcels, keep an eye on the airplanes. Every now and then, you will see an airplane on your screen flying over the city. If you tap the plane, you may get a special package. But, since the drop rate of these packages is low, it’s always advised to grab all the loot; don’t miss any plane. City Upgrade – Why should you buy a new city? As we mentioned above, we all start with Newton City. 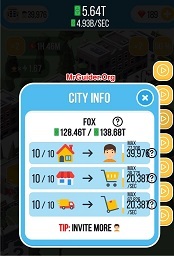 To earn more money, you guys will need to upgrade and shift to a new city by selling the current city once you reach a certain city value. Tap the menu button -> cities -> here you can check all the cities that you have unlocked. Now, the question is why should you buy a new city? In the cities menu, you can check the amount per shopping item. In the high-rank cities, the rate would be higher. So you will make more money. But every time you enter a new city, you will have to progress from scratch. In the same menu, you can check the city value and the value requirement to discover/shift to a new city. Tap the (?) icon for more details. When the prestige gets available, you can earn the prestige points by using this feature. It will send you back to the Newton city, but you will earn these points(keys). Each point(key) will give a 10% earning bonus to your city. The red diamond is the premium in-game currency in Idle Island – City Builder game. You can obtain it by completing the quests, from airplane packages. How to use these red diamonds? You can use these red diamonds for the boosters or instant cash or citizens. Tap the volt button at the bottom menu -> here you can buy the boosters. So this is the Idle Island – City Builder guide for the beginners. Now, let’s have a look at our Idle Island – City Builder tips, cheats & strategies! Every now and then, you will get the random reward and video ads offer on the right side of the screen. In the random reward, you can get red diamonds or Idle money. In the TV Promotion, you tap the play button or x2 button to receive profit booster or instant cash. If you want to progress fast, you should grab all these offers asap. Researches are really important. You can upgrade these researches using the Idle money and get a massive boost in a particular aspect. For example; Births research adds citizens over time, purchase rate/value research increases Idle money per second. Try to max out these researches asap. For the parcels and free reward, keep an eye on the airplanes. Tap them to get instant cash or special packages. From these packages, you may get the epic researches. Add citizens, unlock/upgrade the researches, make more money to increase the city value. Once you reach the next city requirement, upgrade the city ASAP. You will build a new tycoon there from scratch, but it will make you more money than the previous one. When the prestige becomes available, you can sell the whole tycoon for the prestige points/keys. You will get +10% earning bonus in each city from each key points. Keep in mind that if you prestige, you will start everything from scratch. It’s a good idea to use this feature when you are stuck and the next stage requires a huge amount of money. So this is the Idle Island – City Builder guide and some basic Idle Island – City Builder tips, cheats & strategies for the beginners.